We are very pleased to announce that our first Qute babies have been born! Just a few days before Christmas Alison Bates noticed an unusual Nativity scene taking place in her daughter’s brand new Qute. It was only 12 hours after Hamble the hamster had moved into her new home that she gave birth to a nest-full of pups. This came as quite a surprise to Alison, as she had no idea she was pregnant…in fact she had thought that Hamble had been a bit little to leave the nest herself. At first it appeared there were 5 or 6 pups hiding in their nest on the top floor of the Qute, but it was only a few days ago that Alison realised there were a total of 9 baby hamsters. Blimey! She tells us that both Mum and pups are doing well and she is finding them fascinating to watch. And, the best thing is she will keep us all updated on their progress. ‘Like’ our Facebook page to see more photos! Once the little one was upstairs asleep, Mum could finally get on with her knitting. Want to know how our competition winners have been getting on with their Qutes? Well, here’s the latest. Michelle was relieved to be able to throw away her old hamster cage in exchange for a shiny new Qute and tells us “Thank you so much, Lucy loves her new Qute”. 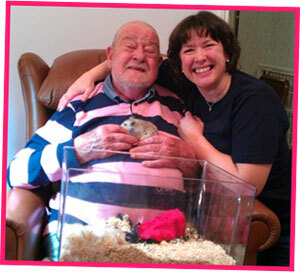 Jane sent us a great photo of herself with her Dad and the Qute, saying “this is so cool as we can put it on Dad’s lap and he gets Jack out, love seeing Dad smile like this”. 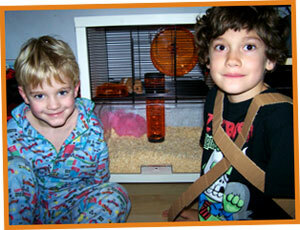 And Nicola sent us an email saying how much her family love the Qute, especially their gerbils Charlotte and Scamper. She calls it “all in all an excellent piece of design”. We completely agree! 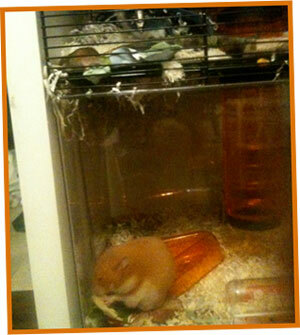 Click here to find out more about the coolest hamster house on the market! They thought the Qute was great, but it turned out the packaging had the X-Factor! The bedding tray doubles as a mobile play station so Jack can have cuddles on the move.